Although you wouldn't normally add grass to your diet, one form of grass produced by sprouting wheat seeds has been part of traditional herbal medicine for many years. Wheatgrass, as it's generally called, contains several vitamins and minerals, along with chlorophyll and several phytonutrients. 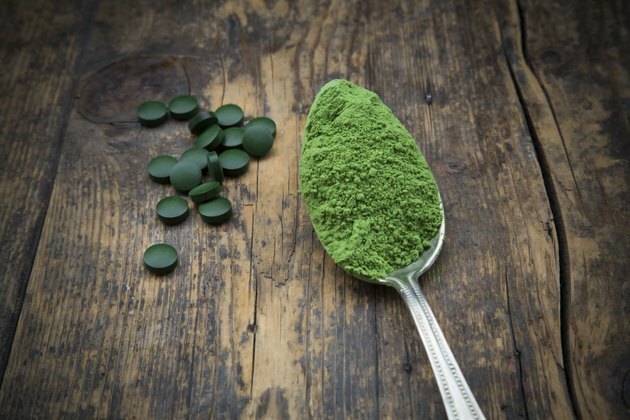 Although fresh grass is often juiced to produce a drink, powdered wheatgrass is also available compressed into tablets -- and it could provide significant benefits for your health. Wheatgrass contains an antioxidant compound called apigenin that may help protect your cells from oxidation by free radicals, which form in your skin when you're in sunlight or in your organs after exposure to environmental toxins. Over time, free radicals can oxidize and damage cellular membranes and DNA, raising your risk of cancer and other disorders. Research published in the June 2010 issue of "Pharmaceutical Research" reports that a diet rich in antioxidant apigenin may be related to decreased risk of breast, digestive, skin and prostate cancer, and some cancers of the blood. The authors of a review published in the January 2007 issue of "International Journal of Oncology" conclude that apigenin-rich foods such as wheatgrass have potential as cancer chemopreventives, but clinical research is needed to confirm this. Apigenin from wheatgrass may also have anti-inflammatory properties, according to experts at Memorial Sloan-Kettering Cancer Center, who attribute this to apigenin, which can prevent certain types of immune cells from attaching to the lining of blood vessels. A study published in the August 2007 issue of ''Nutrition and Cancer'' found that subjects undergoing chemotherapy for breast cancer who consumed wheat grass juice had fewer inflammatory reactions to the treatment compared to a control group. Subjects with ulcerative colitis, an inflammatory condition, also had improved symptoms after taking the juice, according to a paper in the "Scandanavian Journal of Gastroenterology" in 2002, but these potentially significant anti-inflammatory benefits still need confirmation in subjects taking wheat grass tablets instead of juice. Practitioners of traditional medicine recommend wheatgrass to boost oxygenation in the body, attributing this possible effect to its high content of chlorophyll. Although it's not clear whether chlorophyll can transport oxygen in humans, a study published in the January 2010 issue of the "Indian Journal of Pediatrics" found that when 40 subjects with a blood disorder called Thalassemia Major, which requires blood transfusions, took wheat grass tablets, they had an average reduction of 18 percent in transfusions, compared to before they started treatment. The Cancer Center reports that laboratory research suggests components in wheatgrass might also help keep blood cholesterol in a healthy range, but this needs confirmation in humans. Wheatgrass tablets are a significant source of vitamin C and betacarotene, a vitamin A precursor. They also contain folic acid, a B-vitamin, and calcium, iron and potassium. Check product labels to determine the tablets' exact content of these nutrients. Tablets are available from most health food stores, but it's best to purchase supplements certified free of contamination by foreign material or microorganisms. Wheatgrass tablets are generally considered safe, but they may cause a reaction if you're allergic to wheat or are gluten-intolerant. Talk to your doctor to decide if the tablets might be helpful to you.